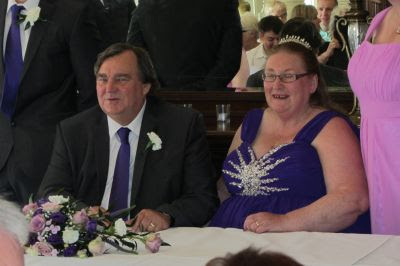 Both Dave and I were delighted to receive an invitation to Eileen and Trevor's wedding on Saturday 18th June 2016. 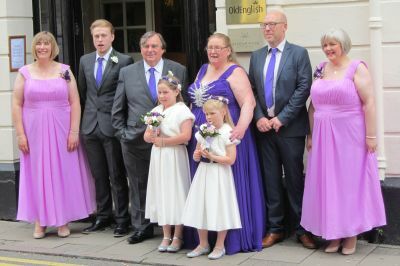 The ceremony and the reception were held at The George Hotel, Huntingdon. We don't usually attend weddings but this one (and another - a family wedding - held in July) was an exception. Having shared Eileen's excitement about her wedding, I was looking forward to the Big Day. Having no previous idea about the wedding dress, Eileen looked so beautiful as she walked into the room in a purple and diamante creation. 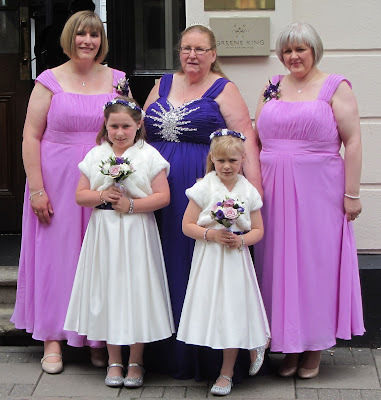 The two matrons of honour wore similar flattering dresses and the young bridesmaids were a joy to behold in their white dresses, white socks, silver shoes and fluffy white boleros. Trevor wore a purple tie, whether by design or accident I don't know. The room for the ceremony and the room for the reception looked stunning decorated in white and purple. Unfortunately we had to leave hurriedly after the wedding breakfast so did not join in the evening celebrations. To our friends Eileen and Trevor: Wishing you every health and happiness as you undertake life's journey together. Congratulations!! Bride, Matrons of Honour and Bridesmaids. 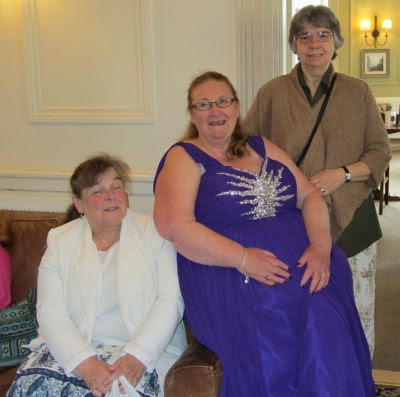 From left to right: Patr (friend of the Bride and Groom), Eileen (Bride), self (friend of the Bride and Groom).